In Japan, kukicha has been stigmatized as a poor man's drink, because, like brown rice, it brings back memories of the days of deprivation during and after World War II. Since it contains only one-tenth the caffeine of sencha and because it is the most alkalinizing Japanese tea, it is considered to be the most balanced beverage. Twigs are steamed, dried, and stored in paper bags for two to three years in order to develop the best flavor. 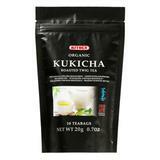 Brown Rice Kukicha is a type of Twig Tea. It is a mixture of 50% tea twigs and 50% kernels of roasted, popped brown rice. After aging, the twigs are cut and graded to size. Each grade is then roasted separately at different temperatures and lengths of time to ensure uniformity. 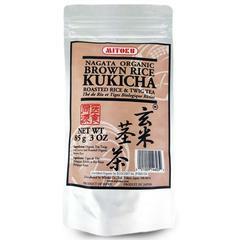 Enjoyed both hot and chilled, Brown Rice Kukicha has a mild, nutty flavor. Dried, ground root of the esteemed Asian water lily, treasured for contributing to respiratory health, with 5% ginger root powder. A pleasant and quick way to take this renown health food. A macrobiotic staple. Boil a teaspoonful for three minutes and sip while hot. Low sodium, fat free, and gluten free. Glass jar. Eden pure, authentic, unadulterated.